In large bowl, stir Cake Base ingredients until well blended. Spread in pan. In another large bowl, beat cream cheese and 3 1/2 cups powdered sugar with electric mixer on medium speed until blended. Beat in 1/2 cup melted butter. Add eggs, one at a time, scraping bowl occasionally. Stir in rhubarb. Pour batter evenly into pan over cake base. Bake 38 to 43 minutes or until golden brown on edges and center is set. Cool completely, about 2 hours. When ready to serve, sprinkle 1 tablespoon powdered sugar over top. Using sharp knife, cut into 6 rows by 4 rows, cleaning knife blade after each cut. Serve with whipped cream. Store loosely covered in refrigerator. To make 2 cups whipped cream, place medium deep bowl and beaters in freezer or refrigerator to chill. Place 1 cup heavy whipping cream and 2 tablespoons powdered sugar in bowl. Beat on low speed until mixture begins to thicken. Add 1/4 teaspoon vanilla, and then beat on high speed until whipped cream forms soft peaks. Be sure to drain the frozen cut rhubarb well after it's thawed to remove any excess liquid before stirring into filling. Recipe uses frozen rhubarb (thawed) but can use fresh if it's in season. 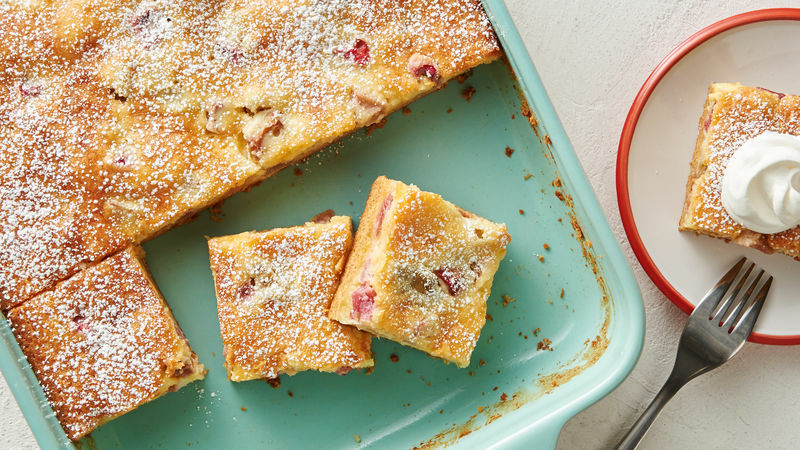 While we love a classic gooey butter cake, we were looking for a streamlined, summertime recipe that would feed a crowd and travel well. That’s how this recipe came to fruition, and it couldn’t have turned out better with the rich, sweet and gooey texture, it really captures the defining characteristic of this classic cake and goes perfectly with tart rhubarb. Psst … If you’ve never tried gooey butter cake, it’s a native of St. Louis “born” of a happy accident that happened during the Great Depression. As the story goes, a baker used the wrong type of butter—a softer butter that was used for adhering decorations to pastries, instead of the firm butter used for baking cakes—since ingredients were too precious to waste, the cake got baked anyway. The result was a dense and fudgy cake that quickly became a bestseller spreading across the city and eventually across the whole country. See for yourself why this cake has such staying power by baking Betty’s Triple Chocolate Gooey Butter Cake or Gooey Pumpkin Butter Cake. If you fall for these bars, you’ll also want to check out our Gooey Sugar Cookie Bars and Cake Mix Gooey Butter Cookies. Do you have rhubarb growing in your backyard? We’ve got more recipes featuring this prolific vegetable—yes, it is actually a veggie, not a fruit. From pies and cakes to muffins and crisps, find all the rest of Betty’s best rhubarb recipes right here.